MUSIC Group Plants Endangered Philippine Trees – In the Heart of Nature | FEED, Inc.
2 September 2016, Famy-Siniloan, Laguna. 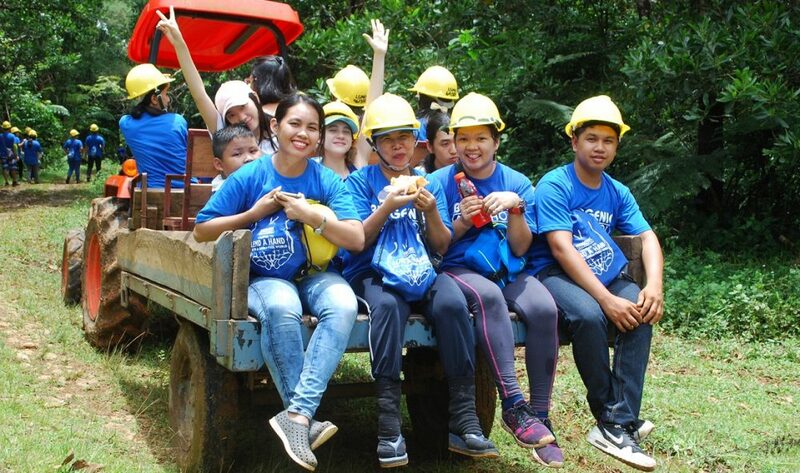 Forty-one Music Group environmental enthusiasts planted young Philippine indigenous wood and fruit-bearing seedlings in the plains of the Sierra Madre tropical forest in the heart of nature. Tropical forests play a valuable role in relation to climate change, being a source and sink of carbon. Young trees are carbon sinks that sequester carbon dioxide rapidly from the atmosphere through photosynthesis, delivering oxygen to the environment. Some of the trees that were planted are on the IUCN Red List of Threatened Species*. MUSIC Group is one of the world’s largest holding companies for pro audio and music products brands. As the corporate parent for world-recognized brands such as MIDAS, KLARK TEKNIK, LAB GRUPPEN , LAKE, TANNOY, TURBOSOUND, TC ELECTRONIC, TC HELICON, BEHRINGER, BUGERA, DDA and EUROCOM MUSIC Group owns and manages some of the finest brands in the audio industry. As a part of the Company’s CSR program to help prevent global warming, this “Living Legacy: Plant a Tree, FEED Our Future” event wa attended by 41 MUSIC Group employees, organized by FEED (Diane Penales, VP, Operations) in collaboration with the University of the Philippines Los Baños (UPLB) led by Foresters Rey Lorida, Laguna-Quezon Land Grant (LQLG) Field Manager and Ben Arizala from the College of Forestry & Natural Resources (CFNR). Over 200 indigenous Philippine trees were planted, including Bagtikan* (Parashorea malaanonan (Blanco Merr. ), Dulit (Canarium hirsutum Willdenow ssp) , balinghasai (Buchanania sp.) Red Lauaan (Shorea negrosensis), and Lanite (Wrightia pubescens R.Br). The selection of species is carried out by the CFNR and LGMO teams of UPLB, as part of the LQLG master plan covering 9000 hectares of land, a part of which is endangered, unstudied and at threat from illegal timberland charcoal operations. Part of FEED and UPLB’s Living Legacy intervention involves working with local farmers, foresters, the Philippine Army’s 2nd Infantry Division (2ID) and the Philippine National Police in a social forestry format whereby local settlers are involved in the reforestation of the Sierra Madres, as an alternative livelihood source. Bagtikan is known as one of the light red Philippine mahogany that is known as white lauan in the market. It is a prominent tree that reaches a height of 35 to 40 meters. Its crown is flat and spreading, with a tendency to outgrow its neighboring trees. The cylindrical bole is from 20 to 25 meters long. The leaves are entire, alternate, and scattered, oblong, pale green beneath, rounded at the base, and shiny. The midrib is very pronounced with five to eight pairs of equally prominent nerves. Bagtikan has yellow flowers tinged with pink, which fall in such a great quantity that they almost cover the ground under the flowering tree. The ovary is hairy. The fruiting calyx has five long wings but their bases are not tightly enclosing the fruit as with those of the Shorea genus. The fruits are less than two centimeters in diameter at maturity. The development of bagtikan fruit takes three to four months. However, development varies in different regions in the Philippines due to variance in climate. The bark of the bagtikan tree has broken ridges 3.8 to 4.3 centimeters thick. The stem bark when cut goes reddish in color while the bark at the buttress when cut turns white. In the Philippines, bagtikan trees can be found in Nueva Ecija, Bulacan, Laguna, Quezon, Camarines, Albay, Sorsogon, Polilio, Samar, Leyte, Masbate, Panay, Negros, Catanduanes, Surigao, Agusan, Bukidnon, Davao, and Zamboanga. Bagtikan grows in primary forests at low altitude. This large native tree is very much known for its superb wood quality. Bagtikan can be planted directly in open areas due to its tolerance towards sunlight. Sadly, this native tree is included in the IUCN Red List of Threatened Species. MUSIC Group provides a comprehensive product range covering multiple product categories to a wide spectrum of end-users including professionals, corporations and amateurs, as well as for public and commercial applications. They include loudspeakers, amplifiers, mixers, powered mixers, computer-based recording and DJ products, microphones, headphones, wireless systems, musical instruments and professional lighting systems. These products can be found in professional and project recording studios, video and broadcast suites, post-production facilities, sound reinforcement applications including houses of worship, stadium clubs, retail locations and on major musical concert tours. For more information on organising your CSR or team-building activity under FEED’s Living Legacy program, visit: https://feed.org.ph/engagement-activities/, email info@feed.org.ph or call +63(0)917 552 4722.